A couple weeks ago I bore witness to a dream of geek culture in a merger of science and art in one t-shirt. A couple years back the guys at Think Geek created a prank product for April Fool’s day (a day I truly love) called the “Personal Sound Track” shirt. This prank gained a huge fan base and so they made this shirt a reality. 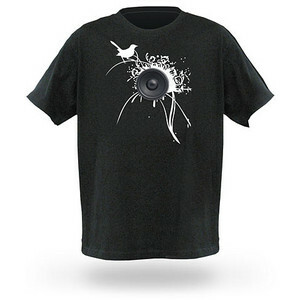 Thus the interactive sound shirts were born. From this came the “Electronic Drum Kit” shirt. Certainly everyone who has ever sat in church beating out mad drum rolls on the seat in front of them would desire this shirt, but some of us need more. Fortunately Think Geek has come through. Witness the guitar shirt. I can imagine any of these shirts would really compliment your super market salsa dancing. Let them try and stop you by not playing Musak when you can bring your own. Thanks. That is a fabulous idea! I heart thinkgeek.com. I still wish I could order the TonTon Sleeping Bag. sigh.